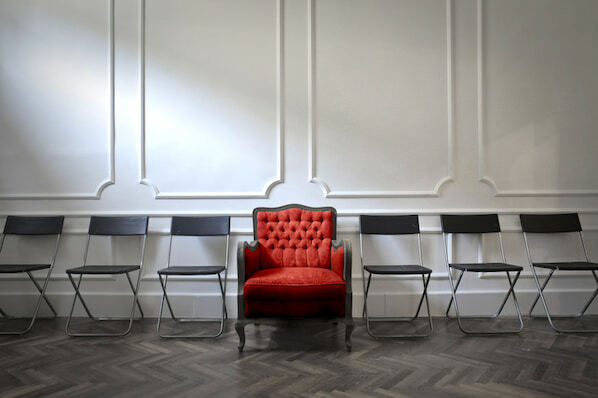 You might trade client (horror) stories with a few other agency execs you know. 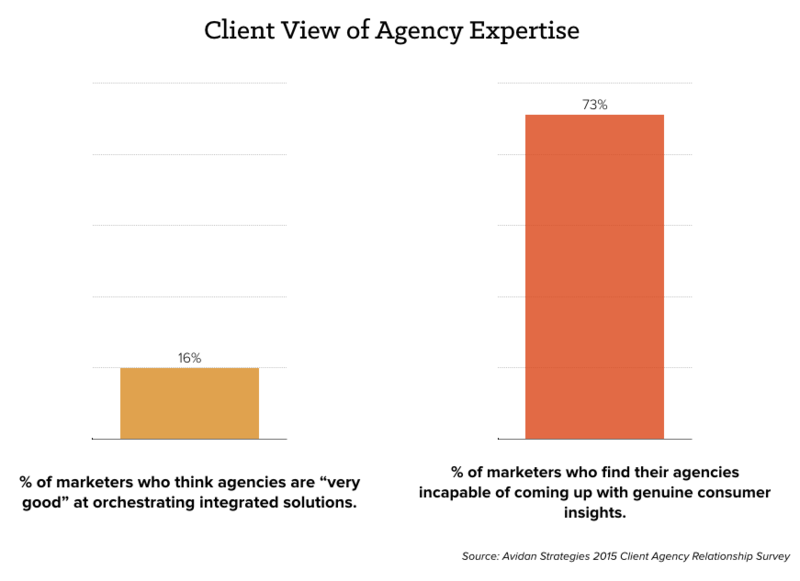 You might belong to an agency group where people share metrics and financials. Maybe a more established firm shared a few documents and lessons from their high-growth period with you. But where else do you go to truly understand the top issues concerning agency leaders and their team members? Data can sometimes point us in the right direction -- giving us a starting point for asking questions, running our own numbers, and figuring out the problem or even the opportunity. 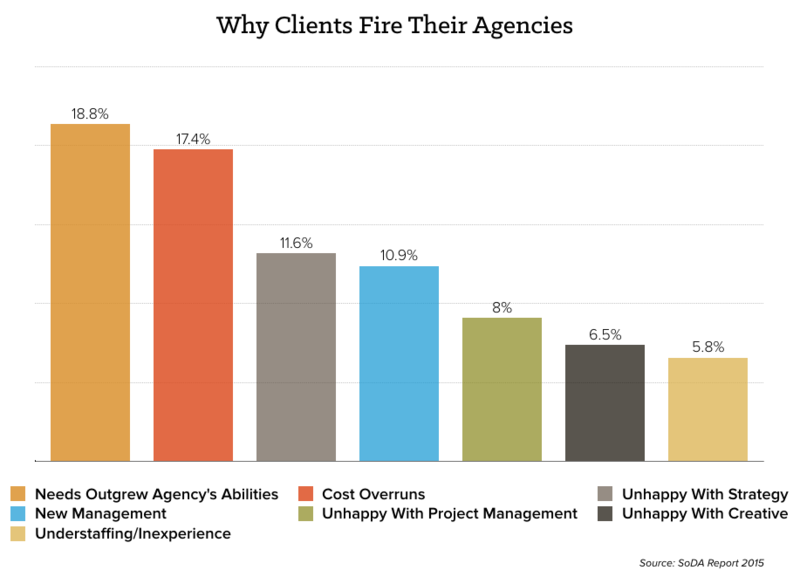 1) Clients fire their agencies because the agency cannot grow with the client, there are cost overruns, or they are unhappy with the strategy. 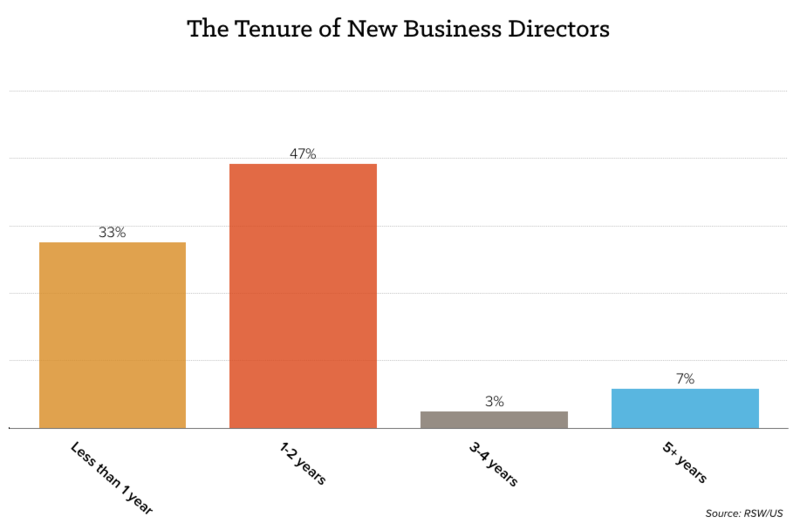 2) The average tenure of a CMO has climbed to almost four years while 80% of new business directors are gone in less than two years. 3) Finding and retaining qualified staff members is the most challenging issue facing agencies. Employee burnout is another interesting concern of agency leaders. 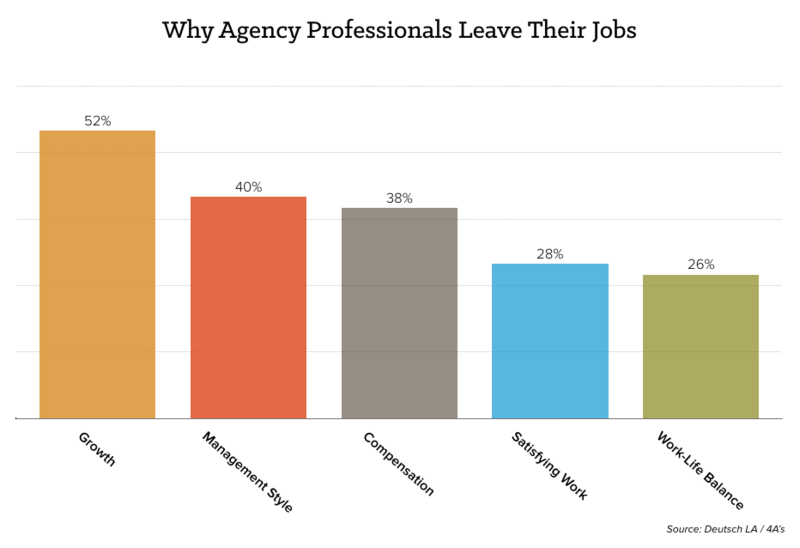 4) Agency professionals leave their jobs because of the lack of growth opportunities and due to management. 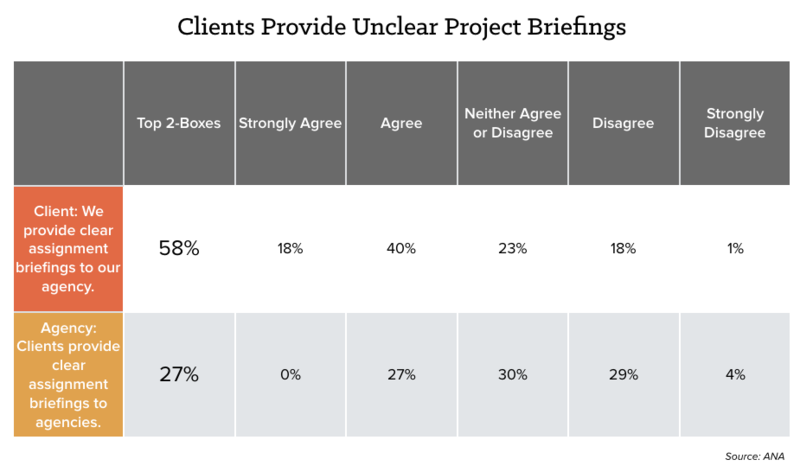 5) Clients and agencies are not in agreement when it comes to the clarity of project descriptions provided by clients. 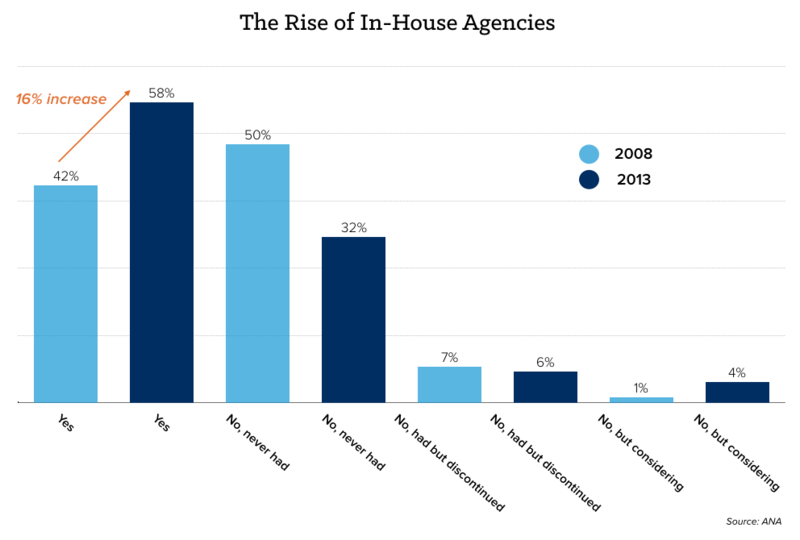 6) The number of marketers engaging zero agency partners increased in 2015 to 27%, which could support the trend of marketers moving agency duties in-house. 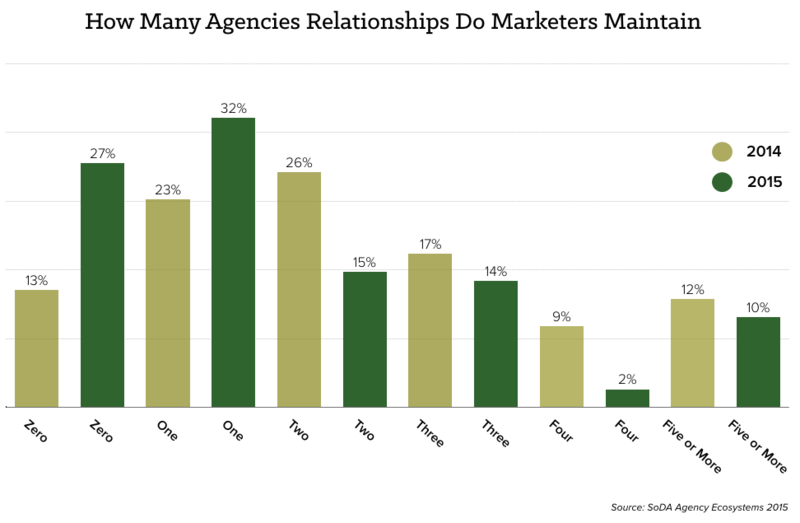 In addition, fewer marketers are maintaining relationships with more than three agencies. 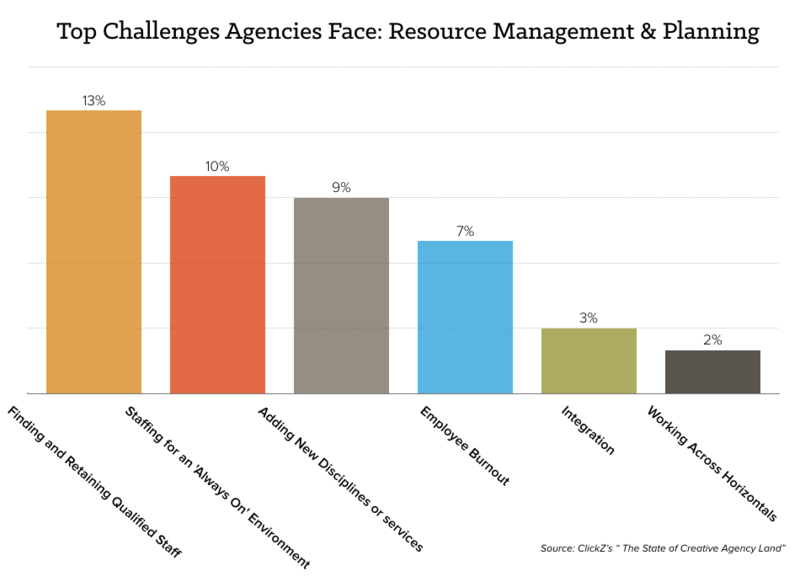 7) A surprising number of marketers lack confidence in their agency's abilities -- either in managing integrated projects or in uncovering insights. 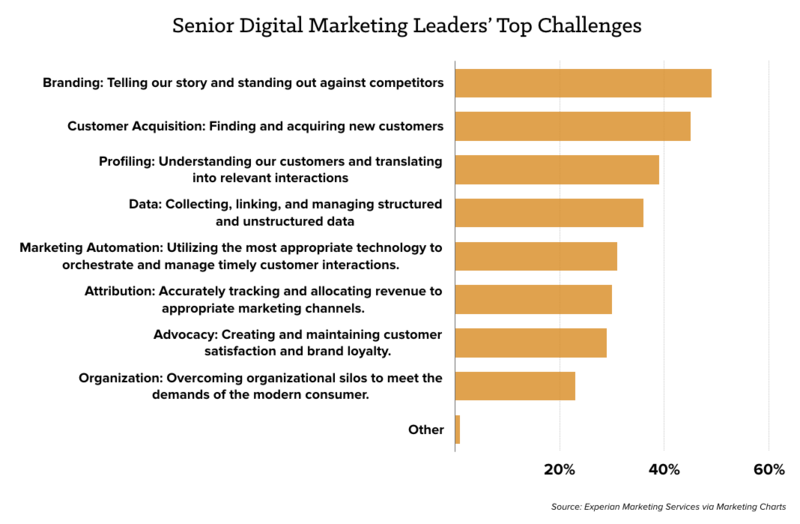 8) Digital marketing leaders state that branding, acquiring new customers, understanding a full picture of customer, managing data, and marketing automation are their current top challenges. 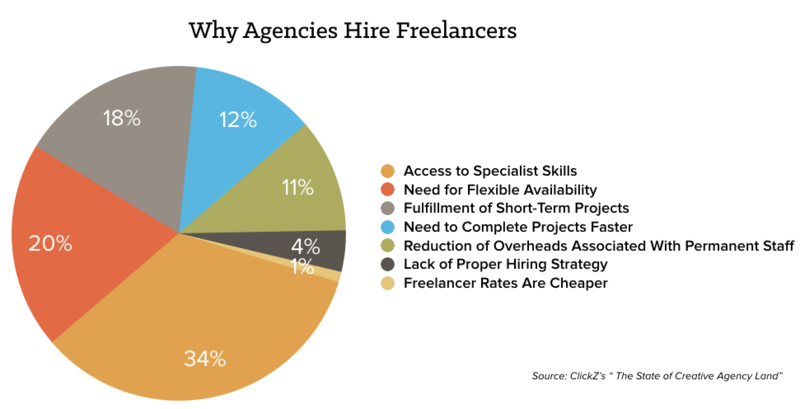 9) 20% of agencies hire freelancers because of their need to add people to a project, and 18% hire freelancers who can complete short-term projects. This directly relates to the issue of relying solely on project-based work and the instability it causes in predicting growth and hiring needs. 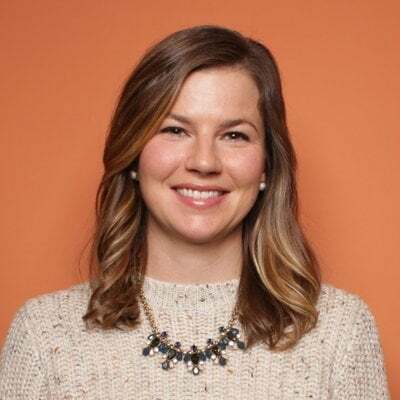 10) More and more marketers are moving agency duties in-house, meaning agencies need to find more ways to add value to their relationships and consider new models of revenue generation. 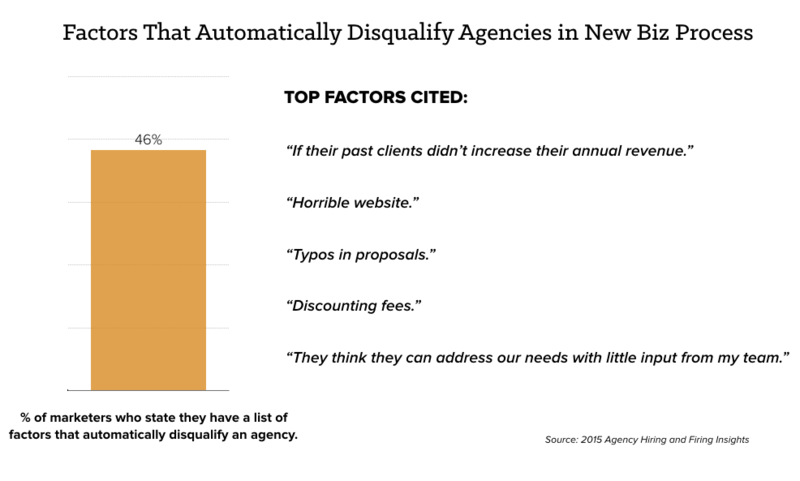 11) 46% of marketers have a list of factors that automatically disqualify an agency, including that the agency discounts their fees or can't prove sales results. 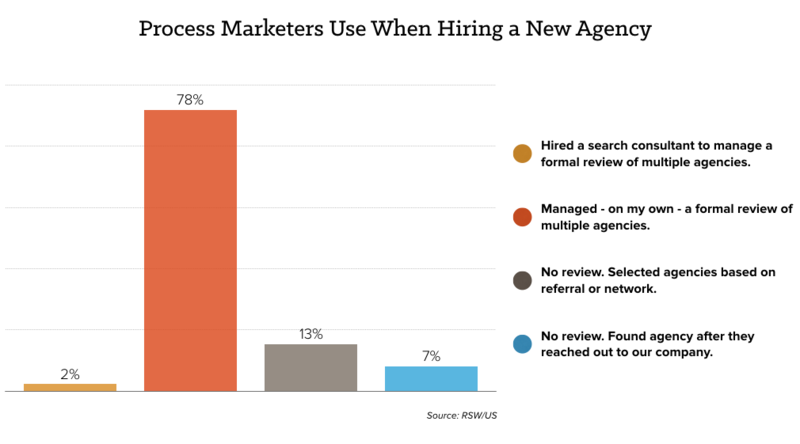 12) 78% of marketers manage their own review of agencies, while only 7% hire an agency after that agency reaches out to them. 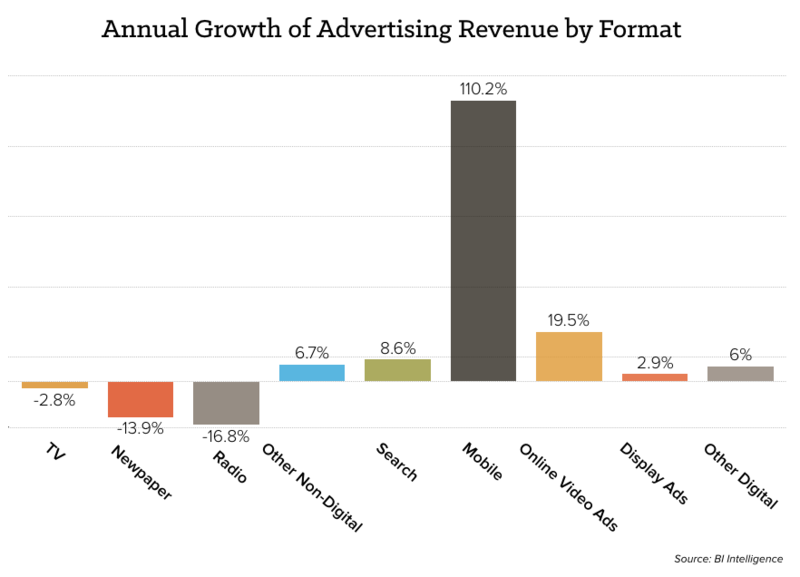 13) According to Business Insider, online video advertising revenue will reach $5 billion in 2016. Agencies should consider how their service offerings and partnerships can help them to capitalize on where ad dollars are moving. 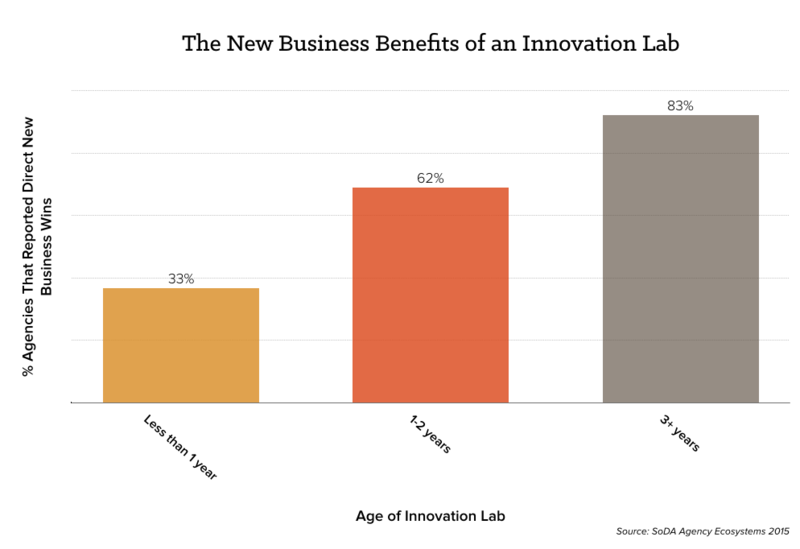 14) Agencies who have launched an innovation lab have seen direct business results in the form of new client wins. 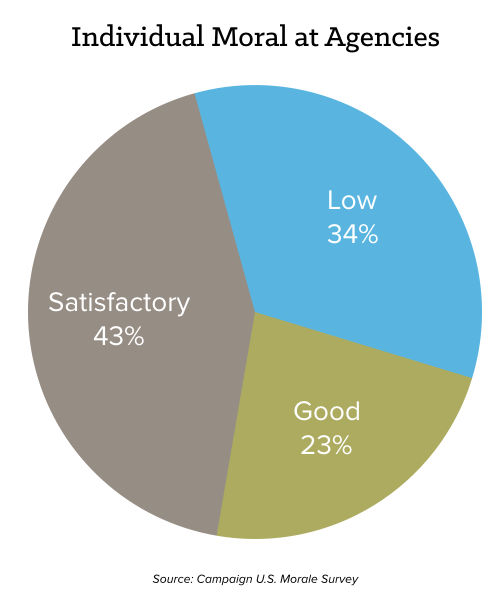 15) 34% of agency professionals stated that the morale at their company was low. Agencies should consider what culture, training, mentorship, and recruiting changes need to be made to be able to compete for top talent. 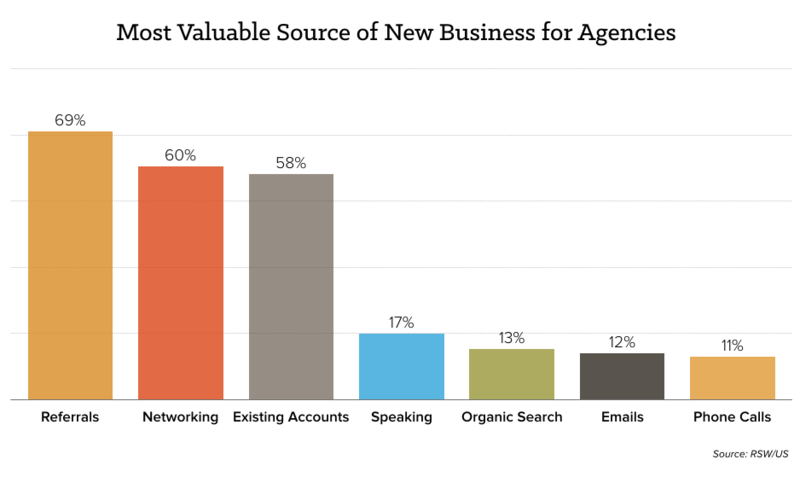 16) The most valuable source of new business for agencies is referrals, networking, and existing accounts -- a signal that more agencies need to better understand how to drive referrals, and they should consider the cost of going into a pitch without any prior relationship. 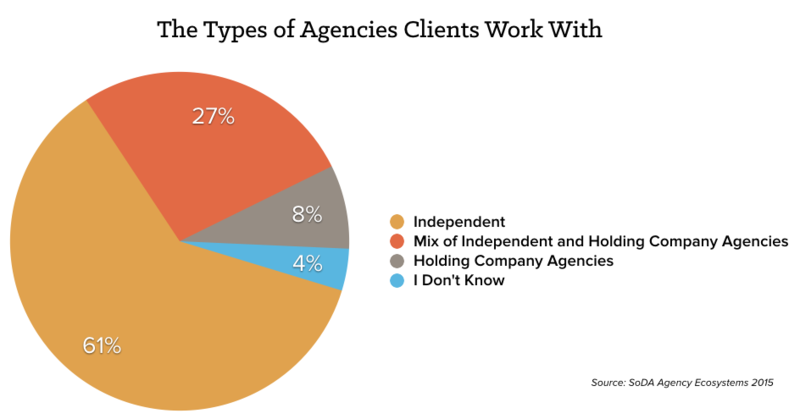 17) 61% of marketers report working with an independent agency, while 8% work with holding company agencies.